If you've been craving an Android tablet with ports-o-plenty, then the Toshiba Thrive is definitely the way to go. Rocking full USB and HDMI ports, as well as a miniUSB port and SD card slot, this dual-core Android 3.1 tablet can handle all of the peripherals that you can possibly throw at it, and for today only, you can grab the 8GB version for $380 from eBay Daily Deals. 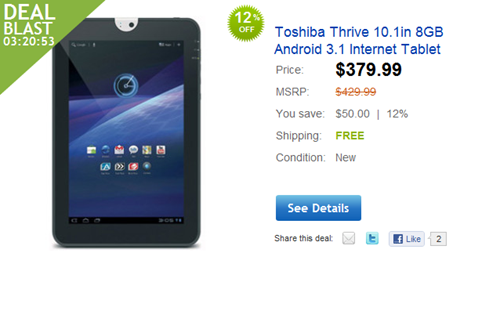 Of course, all those ports come at a price, as this by far the thickest and heaviest Android tablet on the market. If the sacrifice is a worthy one to you, though, hit the link below to pick yours up.